Review of Sledge - "THESE RUGGED DAYS: Alabama in the Civil War"
Alabama's Civil War history has been explored in numerous popular and scholarly books and articles. Art Bergeron, Chester Hearn, Jack Friend, Sean O'Brien, and many others have looked at wartime Mobile and the 1864-65 land and sea campaigns that closed the bay and eventually captured the port city itself. The major cavalry raids that penetrated the state during the war have also been well covered in the literature. Robert Willett's history of Streight's Raid has not been surpassed, and additional studies by Rex Miller (Croxton's Raid), James Pickett Jones (Wilson's Raid), and David Evans (Rousseau's Raid, as part of his larger study of Atlanta Campaign mounted operations) have held up well over time. The 1862 Union occupation of North Alabama and the infamous "Sack of Athens" have also been the topics of fine books by Joseph Danielson and co-authors George Bradley and Richard Dahlen. Most recently, an essay anthology edited by Kenneth Noe and a pair of studies by Christopher McIlwain have offered multi-faceted examinations of Alabama's Civil War and Reconstruction histories. With the above earlier works in mind, the intention of John Sledge's These Rugged Days was to gather together in a single volume an integrated popular overview of Civil War events (primarily military ones) that occurred within the confines of Alabama's borders. 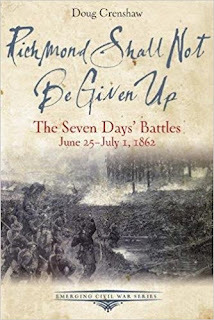 In the book, lengthy chapters recount the blockade of Mobile, the 1862 Union advance across northern Alabama (including the Athens incident), Abel Streight's disastrous 1863 mule-mounted raid, Lovell Rousseau's 1864 cavalry raid, the 1864 Battle of Mobile Bay, James H. Wilson's 1865 campaign that applied the coup de grace to Alabama's industrial heartland, and (also in 1865) General E.R.S. Canby's irresistible finishing stroke at Mobile itself. As a writer, Sledge possesses an appealing gift for evocative prose, his picturesque writing style well suited to drawing in both casual readers and more serious students of Civil War Alabama. His narrative generally follows the top commanders, but it also generously incorporates pithy excerpts from the diaries and letters of common soldiers and civilians from all parts of the state. In terms of source material used, the book synthesizes the published literature (including many of the titles mentioned in the first paragraph above) in an informed manner, but the author also did some primary research in archives and examined numerous newspapers. The text is annotated, and when multiple sources are cited in a single note at the end of a paragraph (a common yet frequently confounding practice) the author very helpfully includes in parenthesis a brief phrase from the text that explicitly matches source to particular passage. The volume is less generous to the reader when it comes to maps and illustrations. In particular, the absence of any military maps is painfully noticeable. Though These Rugged Days is mainly focused on military events by design, the first two chapters discuss the social and political dimensions of the secession crisis and point out the existence of significant pockets of resistance in the state (in particular, the Unionists of North Alabama). The agricultural and industrial importance of Alabama to the Confederacy also comes across strongly in the text. While quotes from the diaries and letters of Alabama women are present throughout, the home front and its perils and privations largely exist in the background. Similarly, how the war affected the institution of slavery in the state and the popular reaction to emancipation go mostly unexplored, with Alabama's large slave population mentioned primarily in the refugee context. These Rugged Days does not aim to be comprehensive state history, and as long as one accepts its relatively narrow center of interest there's quite a bit to admire in its wide ranging overview of the Civil War campaigns and raids conducted inside Alabama. Nearly all readers will possess at least a passing familiarity with Admiral Farragut and Mobile Bay, but many will be surprised at the scale of fighting elsewhere in a state commonly considered to be one of the war's backwaters. Sledge's engaging writing style also hearkens back to that of Foote and Catton, a quality that will undoubtedly broaden the volume's appeal. The tragedy of the Cherokee experience of the American Civil War cannot be understood without a thorough grounding in the factional violence that emerged over 1830s removal, when the Cherokee were forced by the 1835 Treaty of New Echota to exchange their vast ancestral lands east of the Mississippi for new ones in the northeastern part of Indian Territory. Those who resisted removal most strongly, a majority group led by Chief John Ross, came to be pitted against the Ridge faction, whose members acquiesced to the treaty with the view that further recalcitrance would only make things worse for the Cherokee people. With the tribe then deeply split between the Ross and Ridge factions, a murderous blood feud ensued. The divisions remained unresolved in 1861, when the Cherokee, who had just become prosperous again in their new surroundings, were confronted with yet another life-changing decision—the requirement of choosing sides during the Civil War. Though this topic has certainly been explored before in numerous books and articles, a fresh reappraisal is always welcomed. Recently, I came across advanced notice of John Sedgwick's Blood Moon: An American Epic of War and Splendor in the Cherokee Nation (Simon & Schuster, Spring 2018), hoping it might be of interest and also have significant Civil War content. Indeed, the book is advertised as "the story of the century-long blood feud between two rival Cherokee chiefs from the early years of the United States through the infamous Trail of Tears and into the Civil War." Skimming over the rest of the description, I was taken aback by its assertion that John Ross "spoke not a word of Cherokee." I am not sure where this view comes from and from my own reading don't recall this being a common belief. Just this past week I finished revisiting The Confederate Cherokees, and in it the author referenced at least two major speeches that Ross delivered in Cherokee. Really, it strains credulity that a principal chief like Ross could lead at all, let alone navigate the course of an entire people for decades and through such perilous travails, without any command of the language. 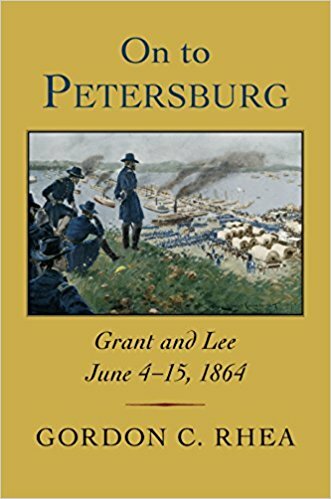 • On to Petersburg: Grant and Lee, June 4-15, 1864 by Gordon C. Rhea (LSU Press, 2017). It probably wasn't planned to be fifteen years between Cold Harbor and On to Petersburg, but here it is, the fifth and final volume of Gordon Rhea's award-winning Overland Campaign series. From the description: "(A)comprehensive account of the last twelve days of the campaign, which concluded with the beginning of the siege of Petersburg(,) On to Petersburg follows the Union army’s movement to the James River, the military response from the Confederates, and the initial assault on Petersburg, which Rhea suggests marked the true end of the Overland Campaign. Beginning his account in the immediate aftermath of Grant’s three-day attack on Confederate troops at Cold Harbor, Rhea argues that the Union general’s primary goal was not―as often supposed―to take Richmond, but rather to destroy Lee’s army by closing off its retreat routes and disrupting its supply chains." While disagreeing with their overall conclusions, Rhea does indicate a willingness to fully consider the views of Grant's critics (in the preface, he graciously singles out Bryce Suderow and Joseph Rose for their research assistance and for challenging his own opinions and assumptions). "While Grant struggled at times to communicate strategic objectives to his subordinates and to adapt his army to a faster-paced, more flexible style of warfare, Rhea suggests that the general successfully shifted the military landscape in the Union’s favor." Rhea also advances a favorable portrait of Lee's generalship during this stage of the campaign. "On the rebel side, Lee and his staff predicted rightly that Grant would attempt to cross the James River and lay siege to the Army of Northern Virginia while simultaneously targeting Confederate supply lines. Rhea examines how Lee, facing a better-provisioned army whose troops outnumbered Lee’s two to one, consistently fought the Union army to an impasse, employing risky, innovative field tactics to counter Grant’s forces." Not that anyone expected an awkward crawl over the finish line, but the volume certainly seems to possess the same look of quality and authority that made the other titles so beloved by many. The numerous George Skoch maps also give it a retro-90s feel (in a good way). Review of Emerson & Stokes, eds. 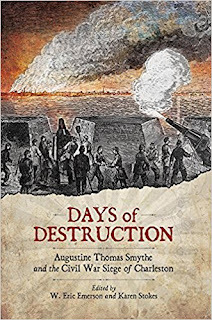 - "DAYS OF DESTRUCTION: Augustine Thomas Smythe and the Civil War Siege of Charleston"
Established in 1860, the United States Army Signal Corps was the brainchild of Major Albert J. Myer. When the Civil War began just a year later, the usefulness of Myer's innovative system of flag communications by day (and torches by night) was immediately recognized by both sides. While the Confederate Signal Corps had a big moment early in the conflict, when E.P. Alexander famously spotted the Union column crossing Bull Run beyond the Confederate left on July 21, 1861, the U.S. Army Signal Corps enjoys more space in the literature. Most recently, a wonderfully edited edition of the memoir of USASC Captain Louis R. Fortescue was published*. Now, with W. Eric Emerson and Karen Stokes's Days of Destruction, the edited correspondence of Confederate signalman Augustine Thomas Smythe, readers are granted an inside view of the other side's Signal Corps, specifically the Charleston detachment. Well-researched and generously fleshed out introductions add essential background and context to published memoirs and correspondence, and the one in Days of Destruction is particularly valuable. In it, Emerson and Stokes provide readers with a wealth of information, including Smythe's family history and a satisfactory discussion of young Augustine's early life. Augustine (or "Gus") was born in Charleston in 1842. His Irish-born father, Rev. Dr. Thomas Smyth (the 'e' was added later), was a Presbyterian minister and his mother, Margaret Milligan Adger, a teacher at the Charleston Orphan House. Smyth's sermons, articles, and books were popular, although some of his southern audience distrusted his northern academic ties and deemed his views dangerously close to abolitionist in outlook. In the end, the elder Smyth regretted secession, but did not oppose it. Augustine shared his father's wider ambition, but not his spiritual career path, and he joined the South Carolina College Corps of Cadets when secession and war loomed. As a member of Company A of the 25th South Carolina Volunteer Infantry, Augustine fought in the Battle of Secessionville on June 16, 1862. Four months later, he was transferred to the Signal Corps. Emerson and Stokes's introduction usefully outlines the history of this support branch of the service and briefly describes the kind of duties that a signalman like Smythe would have been asked to do. The introductory narrative additionally delves into Smythe's personal life and post-war career. A successful lawyer and businessman, Smythe was equally devoted to civic pursuits, serving 14 years in the state senate and actively participating in numerous fraternal and social organizations. Essential to understanding the context of much of the familial friction exhibited in the letters, the editors also helpfully provide background information regarding Smythe's future wife, Louisa (they married in 1865), and particularly his prospective mother-in-law, whose reputation of free-thinking independence preceded her and worried Augustine's more staid mother. Smythe's letters comprise a set of very detailed recordings of major military events (land and sea) that occurred in and around Charleston, all written from the unique perspective of a practiced observer. Passages describe the Battle of Secessionville (when he was still an infantryman) and the capture of the Union gunboat Isaac P. Smith on the Stono River. Smythe was one of four signalmen tasked with helping coordinate the ambush of the Smith, and their assistance was a significant factor in the operation's success. Also in 1863, Smythe provided ship-to-shore signalling from the ironclad CSS Palmetto State and was assigned for a time to Fort Sumter. From the fort, he witnessed firsthand the inexorable advance of Union siege batteries, their massive guns battering from afar both Sumter and the city of Charleston itself. Centrally based at the saltwater bathing house at White Point Garden, Charleston's Signal Corps network operated from fourteen different stations strategically located around the harbor and surrounding islands. From his various assignments, Smythe witnessed many significant events. He was able to view the movements of the CSS Hunley as well as the operations of the CSS David torpedo boat that damaged the USS New Ironsides. He also personally observed the retaliatory 'human shield' practice of placing POWs in harms way, indignantly contrasting the alleged hotel-like treatment accorded Union officers in the city (their "prison" located in a part of Charleston that Smythe claims was hit by a Union shell only once every two months) with the crowded, open air stockade on Morris Island that confined the Confederate "Immortal 600." Smythe's letters readily attest to the importance of the Signal Corps to the longevity of Charleston's defense. Signalman were essential to the rapid passage of military communications above, below, and inside the harbor. They provided an effective early warning system of Union movements while also frequently intercepting and interpreting enemy signals. In one letter home, Smythe rather indiscreetly mentions how his unit cracked the enemy code and were able to read Union Signal Corps messages for some time before discovery. There were also failures to go along with the successes. In 1864, when Sherman's army was closing in on Savannah, the Confederate Signal Corps (with Smythe himself attached) attempted to establish a line of coastal flag stations between Charleston and that place, but the effort was thwarted by the constant threat of surprise intervention by Union landing parties. What stands out most in the Smythe letters are his numerous and meticulously rendered observations of the 1864-65 Union bombardment of lower Charleston. Perched high above the city in the steeple of St. Michael's Episcopal Church beginning in March 1864, Smythe was uniquely placed to witness and document the relentless shelling. In the exhaustive manner of an insurance inspector, Smythe describes in his correspondence the damage inflicted on many different homes, neighborhoods, and public buildings, often forensically tracing the path of single shells. Undoubtedly, much of this attention to detail can be traced to the fact that his own home, and those of friends and family, were located in the bombardment zone. Smythe accepted great risk by sleeping at his otherwise deserted home, which was constantly threatened by shell and robber. In fact, his letters provide readers with a vivid picture of the lawlessness of the city's many near empty neighborhoods, where thievery and vandalism committed by soldiers and civilians alike were widespread. Though his claims are unconfirmed, Smythe also seems to indicate that loss of life in the city was greater than commonly supposed, asserting by late 1864 that somewhere between one and three non-combatants were killed by enemy shells each day. When it comes to the publication of firsthand Civil War accounts written by soldiers, the letters, diaries, and memoirs of those that served in the main armies (particularly the celebrated Virginia front protagonists) heavily predominate, and this volume constitutes a highly refreshing change from the norm. The edited correspondence contained in Days of Destruction comprises a remarkable and wholly distinctive record of the Siege of Charleston as witnessed through the trained eyes of a Confederate Signal Corps member. It is highly recommended. * - Service with the Signal Corps: The Civil War Memoir of Captain Louis R. Fortescue edited by J. Gregory Acken (Univ. of Tenn. Press, 2015). 1. It's been a while since I did an author interview. Coming up soon I'll post my conversation with retired NPS historian Douglas McChristian. We'll be talking about his new book Regular Army O! : Soldiering on the Western Frontier, 1865-1891 (2017), but many of the questions will be steered toward Civil War connections. 2. The long-awaited release of Gordon Rhea's On to Petersburg: Grant and Lee, June 4-15, 1864 (September 2017) is just a few short weeks away. Impatient devotees of this destined-to-be-a-classic series will finally get the last piece of the puzzle, and inquiries here as to its progress can finally cease! 3. In recent years, Savas Beatie has increasingly become a reprint destination for long out-of-print titles from outside sources. I just stumbled across another venture in that territory, and it's a welcome one. At various times, William Scaife's original editions of his many atlas studies (and even some of the paperback follow ups) commanded, or at least asked for, premium prices on the secondary market. If you took the long game, you could eventually find some of them at reasonable prices, but now it looks like SB is going to be re-releasing select titles (and maybe more?) in hardcover. The current release date is pretty far off and, if past history is any kind of indicator, likely to change. 4. For quite a while now, the home page of Two Trails Publishing has been offline. Its demise hasn't been confirmed, but there have been indications over the past few years that things were slowing down considerably over there. Like many publishers big and small, their catalog is a bit of a mixed bag in terms of quality, but Two Trails was digging deep into Civil War Missouri long before it was trendy to do so and I will always appreciate in particular the very useful Trans-Mississippi primary source materials they published over the years. 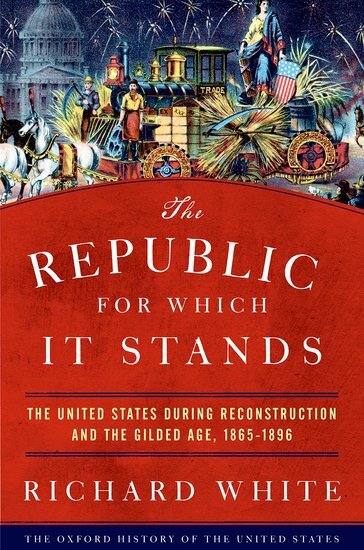 • The Republic for Which It Stands: The United States during Reconstruction and the Gilded Age, 1865-1896 by Richard White (Oxford UP, 2017). The Oxford History of the United States series is a highly decorated one. In its ranks sit, among others, James McPherson's Battle Cry of Freedom, Gordon Wood's Empire of Liberty, and Daniel Walker Howe's What Hath God Wrought, each title examining some grand epoch of American history. The latest is The Republic for Which It Stands. In it, "acclaimed historian Richard White offers a fresh and integrated interpretation of Reconstruction and the Gilded Age as the seedbed of modern America." In the three decades since the end of the Civil War, "(t)he country was larger, richer, and more extensive, but also more diverse. Life spans were shorter, and physical well-being had diminished, due to disease and hazardous working conditions. Independent producers had become wage earners. The country was Catholic and Jewish as well as Protestant, and increasingly urban and industrial. The "dangerous" classes of the very rich and poor expanded, and deep differences -- ethnic, racial, religious, economic, and political -- divided society. The corruption that gave the Gilded Age its name was pervasive." White examines at length the national response to this dizzying pace of change. More from the description: "These challenges also brought vigorous efforts to secure economic, moral, and cultural reforms. Real change -- technological, cultural, and political -- proliferated from below more than emerging from political leadership. Americans, mining their own traditions and borrowing ideas, produced creative possibilities for overcoming the crises that threatened their country." Coming in at nearly 1,000 pages of text, the volume's physical girth matches its breadth and ambition. There are numerous maps and illustrations, and readers will appreciate the employment of footnotes vs. endnotes so they can avoid having to constantly flip this book's massive text block back and forth. Instead of a full bibliography, you get an extensive bibliographical essay. Many books and articles have examined important aspects of California's Civil War, but the literature has yet to produce a full-length and truly comprehensive study of the state's role in the conflict. There's little doubt that today's Californians as a whole are largely unaware of just how deeply and directly the 1861-65 war affected the Golden State, and Richard Hurley's California and the Civil War gamely attempts to inform the modern public about a significant moment in their history. A sweeping overview intended for a popular audience, the book is a more than solid introduction to the topic. In the beginning, Hurley provides readers with a brief synopsis of California politics and society during the years leading up to the war. Throughout the antebellum decade of statehood, Southern Democrats (the "Chivalry") enjoyed an outsized influence in elected state positions and congressional representation, though the infamous Broderick-Terry duel and other events eroded their support. Abraham Lincoln won California with only 32% of the vote in 1860, but, as was the case in many other closely divided states, the outbreak of Civil War dramatically realigned political power in California. The combination of a fusion of War Democrats with surging Republicans, meant that Southern Democrat influence declined steadily in 1862 and accelerated drastically during the 1863-64 war years. By the end of the 1864 national election, political realignment was convincingly solidified. Lincoln easily captured the state with over 58% of the vote, and the Union Party had an overwhelmingly secure hold on the California legislature. The activities of several prominent individuals are profiled by Hurley. For example, the book traces the career of Unitarian minister Thomas Starr King and shows how King became perhaps the greatest evangelist for the Union cause in the state, his tireless efforts even credited for causing his early death. Apocryphal or not, an admiring Lincoln is said to have deemed King "the man who saved California for the Union." On the other side, Hurley praises Albert Sidney Johnston (soon to be the Confederacy's second-ranking general) for not actively working toward creating another bloody front of the war inside California's borders. While others have noted Johnston's unwillingness to promote the secessionist cause while still in the uniform of the United States, it does seem to be a considerable exaggeration to personally credit Johnston with the lack of robust guerrilla action in the state. Civil War guerrilla conflicts were not typically associated with West Point trained officers, who generally denounced the practice and its tendency to sow domestic chaos and detract from the conventional war effort. It's much more likely the case that Johnston never even considered the guerrilla option before leaving California, let alone rejected it upon sober reflection. California and the Civil War perceptively notes the greatly disproportionate financial influence of California and Californians. A steady stream of wartime bullion shipments to the east fed a voracious federal treasury and helped stabilize U.S. paper currency. Partly through the fundraising efforts of the aforementioned Starr King, individual Californians donated vast sums to the U.S. Sanitary Commission, eventually reaching one quarter of the total raised during the war. As an example of California's patriotic generosity, the book highlights the story of the repeated auctioning of 'Gridley's flour sack' (an event made famous in Mark Twain's Roughing It, enhanced as it probably was in the telling). When the Regular Army abandoned forts and posts throughout the vast West in the opening moments of the war, it was left to California volunteers to fill the void. Hurley clearly appreciates the magnitude of this important military contribution, and his book includes numerous accounts of California's new role as protector of the western trails and settlements as well as a potent fighting force in its own right. Chapters cover the march of the famed California Column across the Desert Southwest to New Mexico and the critical role of California regiments in the conduct of punitive campaigns against the Apache, Navajo, Comanche, Kiowa and Shoshone. The Union officers that led these operations (ex. James Carleton, Patrick Connor, Christopher "Kit" Carson, and others) are profiled in the book. Hurley also spotlights the noteworthy eastern theater involvement of Californians, which started with the famous "California Hundred" and was eventually expanded into a full battalion. As mentioned above, the book is interested in exploring the question of why California, with its Border State demographics, was able to avoid the ugly brand of all-out inner civil war that devastated Missouri and Kentucky. There is no clear answer to this in the book, but the author persuasively suggests that the state's extreme isolation, with its inherent lack of cross-border safe harbors and nearby supporting conventional forces, effectively dampened the prospects of pro-Confederate bushwhacking. Other factors undoubtedly contributed, as well. Repressive wartime measures (e.g. newspaper suppression and arbitrary incarceration of civilians) were applied to California by military authorities, but they lacked the broad extremity of those practiced in the Border States far off to the east. Also, many men went to California in the first place to escape the nation's domestic troubles and were not keen on introducing then anew into their adopted homes. That said, the book does cover some isolated pro-Confederate irregular actions that did occur in the state. The most well known of these is the failed plot to seize the schooner J.M. Chapman in San Francisco and convert it into a Confederate privateer. Some tiny partisan groups did form in California (with the Santa Cruz Mountains being a popular refuge), but, in common with guerrilla colleagues elsewhere, it's unclear if their self-proclaimed Confederate ties were simply an excuse to perpetrate criminal acts. One of these bands, Captain Ingram's Partisan Rangers, perpetrated a lucrative stagecoach heist in June 1864, but the robbers were quickly tracked down by local law enforcement and dispersed. Typical with books of this type, the research approach employed by the author is one of synthesis, and those sources used in the book are indeed primarily informed selections from the published literature. The text is annotated, and Hurley's bibliography also usefully provides brief critical commentary on every source listed there. California and the Civil War is definitely worthy of recommendation as a highly accessible introduction to the topic. One hopes that the book will achieve some measure of success in raising awareness of the state's many important contributions to Union victory. • 1865 Alabama: From Civil War to Uncivil Peace by Christopher Lyle McIlwain, Sr. 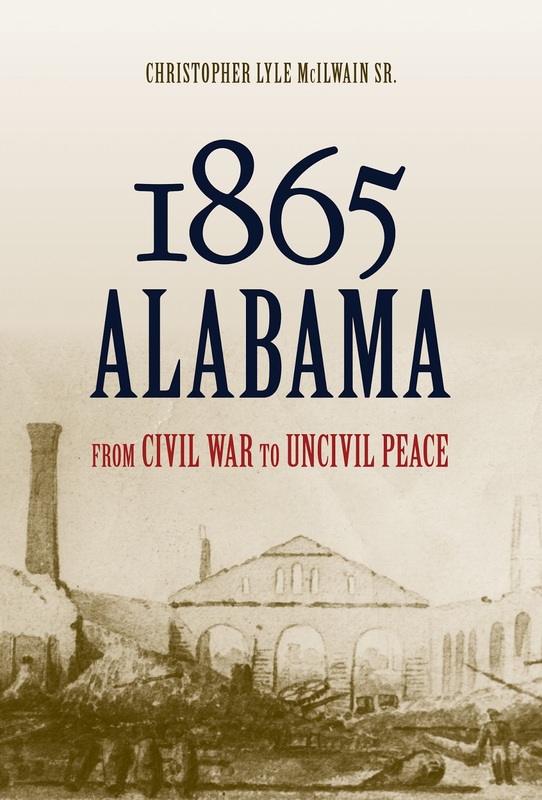 In 1865 Alabama, author Christopher McIlwain "examines the end of the Civil War and the early days of Reconstruction in the state and details what he interprets as strategic failures of Alabama’s political leadership. The actions, and inactions, of Alabamians during those twelve months caused many self-inflicted wounds that haunted them for the next century." The author's thesis "focuses on four factors: the immediate and unconditional emancipation of the slaves, the destruction of Alabama’s remaining industrial economy, significant broadening of northern support for suffrage rights for the freedmen, and an acute and lengthy postwar shortage of investment capital. Each element proves critically important in understanding how present-day Alabama was forged." In the final estimation, the book "provides a sifting analysis of what really happened in Alabama in 1865 and why it happened—debunking in the process the myth that Alabama’s problems were unnecessarily brought on by the North. The overarching theme demonstrates that Alabama’s postwar problems were of its own making. They would have been quite avoidable, (the author) argues, if Alabama’s political leadership had been savvier." Alabama 1865 is a companion to McIlwain's earlier study Civil War Alabama (Alabama, 2016), which covers the war years (I don't have a copy of it, so can't comment on it). Apparently, readers will not find themselves nodding to themselves throughout McIlwain's overviews. According to George Rable's Civil War Alabama jacket blurb, the author "advances a number of striking and controversial interpretations." In similar vein, in Alabama 1865 McIlwain offers a "controversial argument regarding the effect of Lincoln’s assassination." 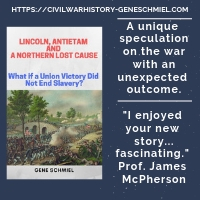 More on this from the book description: "Most historians assume that Lincoln favored black suffrage and that he would have led the fight to impose that on the South. But he made it clear to his cabinet members that granting suffrage rights was a matter to be decided by the southern states, not the federal government. Thus, according to McIlwain, if Lincoln had lived, black suffrage would not have been the issue it became in Alabama." 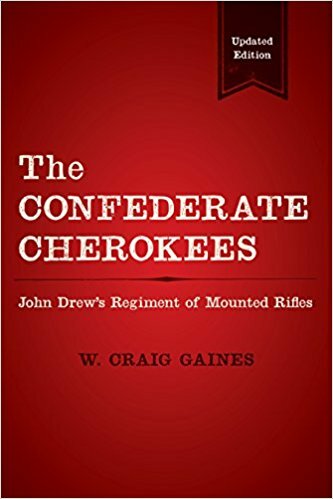 • The Confederate Cherokees: John Drew's Regiment of Mounted Rifles, Updated Edition by W. Craig Gaines (LSU Press, 2017). The Confederate Cherokees "provides an absorbing account of the Cherokees’ involvement in the early years of the Civil War, focusing in particular on the actions of one group, John Drew’s Regiment of Mounted Rifles." By examining a Cherokee society deeply riven by antebellum factionalism between those that acquiesced to treaty removal to Indian Territory and those that violently opposed it, the book explains the complex loyalties involved and provides the context behind the unit's nearly wholesale desertion to the Union side during the early part of the war. Those that remained under the gray banner "earned a degree of infamy during the Battle of Pea Ridge, in Arkansas, for scalping Union soldiers," though the facts related to that event are still contested. When first published back in 1989 [it was also issued in paperback in 1992], this study was truly groundbreaking. I read it much later than that and recall enough dated content to welcome the release of a new edition. I have both books in front of me now, and the only difference I can see between them is the new preface, which is three very brief paragraphs in length. In it, the author acknowledges the many books and articles related to the Cherokee Civil War experience that have been published since 1989, but unfortunately I don't see any evidence that any of this has been incorporated into the new edition. There aren't any sources listed in the bibliography that are dated post-1980s. It looks like a straight reprint. A number of books have examined the relationship between the U.S. government and Utah Territory during the Civil War era, most recently John Gary Maxwell's The Civil War Years in Utah: The Kingdom of God and the Territory That Did Not Fight (2016). Another book, Brent Rogers's Unpopular Sovereignty: Mormons and the Federal Management of Early Utah Territory (2017), examines the power conflict in the territory between Mormon settlers and the U.S. government and connects it to "larger conversations about popular sovereignty and the expansion of federal power in the West," issues that tore at the fabric of the nation as a whole during the last half of the 1850s. 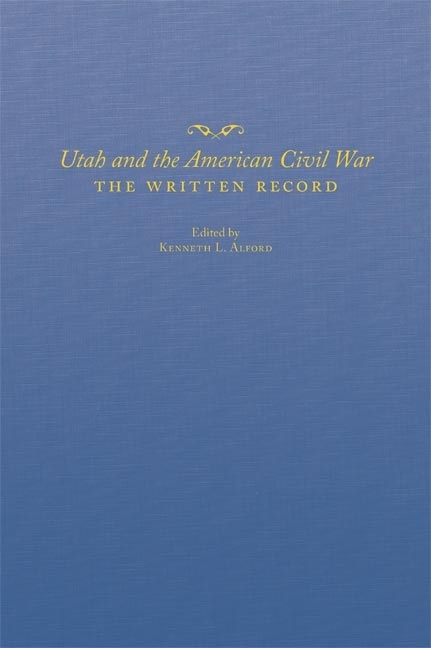 A thick tome, editor Kenneth L. Alford's Utah and the American Civil War is a documentary study of the war years in Utah. "Organized and annotated for easy use, this rich mix of military orders, dispatches, letters, circulars, battle and skirmish reports, telegraph messages, command lists, and other correspondence shows how Utah’s wartime experience was shaped by a peculiar blend of geography, religion, and politics." Alford "opens the collection with a year-by-year summary of important events in Utah Territory during the war, with special attention paid to the army’s recall from Utah in 1861, the Lot Smith Utah Cavalry Company’s 107-day military service, the Union army’s return in 1862, and relations between the military and Mormons. Readers will find accounts of an 1861 attempt to court-martial a Virginia-born commander for treason, battle reports from the January 1863 Bear River Massacre, documents from the army’s high command authorizing Governor James Doty to enlist additional Utah troops in October 1864, and evidence of Colonel Patrick Edward Connor’s personal biases against Native Americans and Mormons. A glossary of nineteenth-century phrases, military terms, and abbreviations, along with a detailed timeline of key historical events, places the records in historical context." Review of Smith - "JOSEPH BROWN AND HIS CIVIL WAR IRONCLADS: The USS Chillicothe, Indianola and Tuscumbia"
Myron Smith's prolific body of work represents a profound contribution to Civil War naval history. Already at eight large volumes published over the past decade (including this one) with another on the way, his work documents at unprecedented depth the men and machines involved in countless riverine operations conducted throughout the inland west. Along the way, he raises awareness of many significant yet largely forgotten historical figures. One of these little-remembered men is Joseph Brown, the Missourian responsible for the construction of three ironclads and the conversion of dozens of tinclads, his life and various careers the subject of Smith's latest book Joseph Brown and His Civil War Ironclads, a volume that also pulls double study as a detailed service history of the U.S.S. Chillicothe, Indianola, and Tuscumbia. Brown was born in Scotland in 1823, and his family eventually left their home country for the United States, arriving at St. Louis by way of Canada in 1834. Joseph and his brother George eventually inherited the family business, but Joseph was drawn to the river, eventually becoming a steamboat captain and builder, and George to politics. Though a staunch Democrat, Brown supported the war effort from the start, and, when the War Department solicited designs for more ironclad vessels to supplement the famous yet flawed City-Class series, he jumped at the opportunity. Brown was not a formally trained naval architect, but he was a very experienced river expert and steamship builder. Perhaps of equal importance, he also possessed the political awareness and connections (partly through his politician brother, George, at the time the U.S. Senate's sergeant-at-arms) to effectively exploit his strengths for his own and the country's gain. As stated above, the book is equal parts Brown biography and gunboat history. Ironclad construction is discussed at some length, with painstaking attention paid to the distinguishing features of each vessel. Brown's designs attempted to address the chief complaints regarding their City-Class predecessors, in particular their lack of speed and overall protection, the relatively middling size of their guns, and their poor maneuverability. Two of Brown's three ships would have a combination of twin rear paddlewheels and screws (while the third and smallest, the Chillicothe, would be paddle only), but each was faster and more maneuverable than the Pook Turtles. Improving on the City-Class's 8-inch variety, Brown added 9 and 11-inch Dalhgrens to his gunboats (a significant upgrade in weight of shot). Though much thinner than in the front, there was also aft iron plating. While the trio was similar in appearance, they were vastly different in size, with the massive "broad giant" Tuscumbia dwarfing both Chillicothe and Indianola. In the narrative, events from the vessel service histories are reconstructed in minute detail and from a variety of perspectives. Lengthy chapters are devoted to each vessel in turn, placed in the book in order of commissioning (which, like the size range, also turned out be alphabetical in sequence). All three were completed in early 1863, just in time to make their marks in the Vicksburg Campaign. With the smallest vessel getting the thickest chapter, Smith meticulously recounts the Chillicothe's participation in the 1863 Yazoo Pass and 1864 Red River expeditions. The Indianola had the shortest career of the three by far, its promising blockade of the river south of Vicksburg cut short by its dramatic ramming and sinking after only a month with the Mississippi Squadron. Its salvaging is also examined at great length. Last to enter service, the Tuscumbia ran the Vicksburg batteries with the main fleet in April, but was badly battered at Grand Gulf and taken out of action. Quickly repaired, the behemoth bombarded the Vicksburg defenses in support of the land campaign, but, after being sent up river for more extensive repairs, did only limited duty for the rest of the conflict. 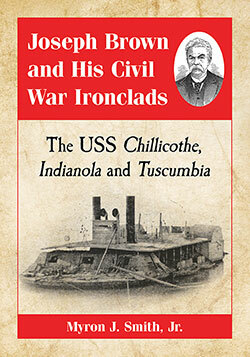 Like so many Civil War vessels, Brown's ironclads had both promoters and many detractors. As Smith so well demonstrates in the book, the three ironclads had obvious flaws and a mixed fighting record. While they did have the improved speed and maneuverability that they were designed for, protection from enemy shot proved disappointing. This was blamed on inadequate backing to the armor as well as shoddy construction (ex. wrong type of bolts holding the iron plates in place). The gunboats were also under-engineered when it came to structural support, though some of the blame can be placed on mid-construction design changes insisted upon by the navy. Problems were probably inevitable, as the vessels were quick-built and always regarding as little more than stop-gap measures. Of course, this was little consolation to the officers and men required to serve aboard them. Unfortunately, Brown did not leave behind much in the way of personal papers (in addition to official documents, the bibliography lists only an autobiographical statement published in 1889), but through a rich array of other source materials (especially a huge number of newspapers), the author was able to piece together a remarkably thorough account of Brown's professional life, his interactions with others, and his accomplishments. When it comes to discussing controversies and conflicting interpretations in the text, Smith does engage the work of other authors, but is more content with identifying differences rather than adjudicating them. Like all of Smith's books, this one is heavily laden with maps, photos, and drawings. The author did a fine job of trying to uncover all known photographs and period drawings of each vessel for inclusion in the volume. He also was able to reproduce modern expert David Meagher's exquisitely detailed plan drawings of the three ironclads, though one wishes each view could have been scaled up to full-page. Building ironclads wasn't Brown's only direct contribution to the Union Navy's war effort on the western waterways. He was also responsible for the conversion processing of 55 of the 66 tinclads that eventually served, and at an economical cost to the government of only $8,500 per gunboat. Though the documentation of this achievement represents only a small part of the book, one might argue that the tinclad work was even more significant to the overall war effort than the ironclads. As with the ironclads, the quality of work came under criticism in some quarters, but perhaps that was inevitable given the scale and speed of construction required. The book does devote a substantial amount of space to Brown's post-war life. He returned to the river as an officer in a ferry company, but he also saw the future of transportation and invested in railroads, even becoming a company president and industry promoter. He was elected to one term in the Missouri legislature, where he opposed Radical Republican initiatives limiting the citizenship rights of ex-Confederates, and also served as the mayor of St. Louis. Deeply affected by the early deaths of his brother, wife, and beloved adopted daughter, he became an open devotee of the Spiritualist movement that fairly exploded in popularity after the war, as well. It might be argued with some conviction that Myron Smith's series of biographical and operational studies in conjunction with Robert Browning's blockading squadron trilogy represent the two most significant contributions to Civil War naval studies published over the past twenty-five years. Smith's latest book adds yet another layer to this already impressive achievement. In singular fashion, Joseph Brown and His Civil War Ironclads brings renewed attention to the life of an important figure in U.S. naval history, a person who was well known at the time but has since faded into undeserved obscurity. • These Rugged Days: Alabama in the Civil War by John S. Sledge (Univ of Ala Pr, 2017). Published by University of Alabama Press with support from the Alabama Bicentennial Commission, These Rugged Days: Alabama in the Civil War is a part of the state's official commemoration of that milestone. It is "(f)ocused on the conflict’s turning points within the state’s borders." Using "official records, diaries, newspapers, memoirs, correspondence, sketches, and photographs," the book "charts residents’ experiences from secession’s heady early days to its tumultuous end, when 75,000 blue-coated soldiers were on the move statewide." 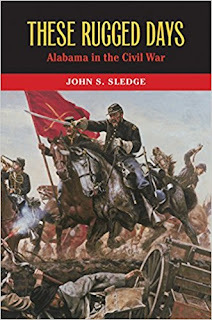 Intent on engaging a popular audience, "Sledge offers a refreshing take on Alabama’s contributions to the Civil War that will intrigue anyone who is interested in learning more about the state’s war efforts. His narrative is a dramatic account that will be enjoyed by lay readers as well as students and scholars of Alabama and the Civil War." From a glance through the text and table of contents, there are certainly politics and society at war elements within, but the heaviest focus does appear to be on military topics. Lengthy chapters cover the 1863 Streight and 1864 Rousseau cavalry raids, the 1864 Battle of Mobile Bay, General Wilson's devastating 1865 campaign that gutted the interior, and the massive Union operation that finally seized the defenses of Mobile itself in the waning moments of the war. 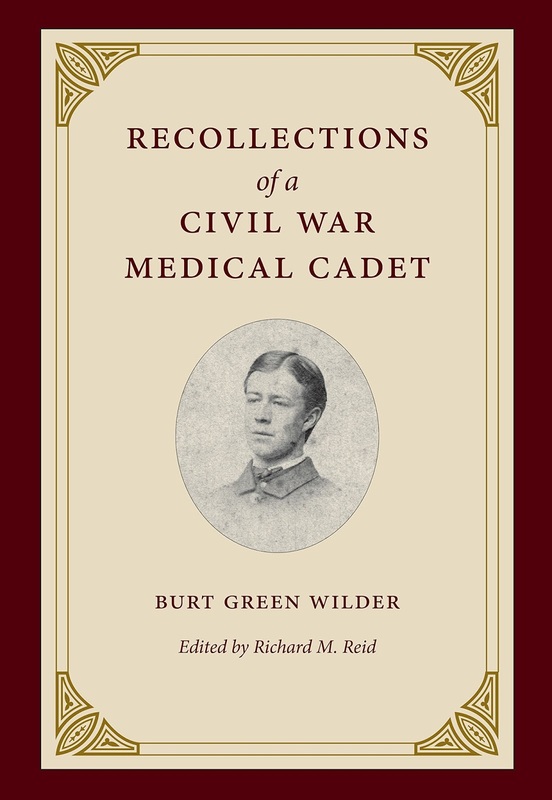 • Recollections of a Civil War Medical Cadet: Burt Green Wilder edited by Richard M. Reid (Kent St Univ Pr, 2017). In mid-1862, Burt Green Wilder had just finished his Harvard training as a comparative anatomist, and his scientific background allowed him to obtain a medical cadet slot at the Judiciary Square military hospital in Washington. "These qualities (of formal training) were increasingly valued in a medical department being reformed by the new surgeon general, William Hammond, who demanded a more scientific approach to medical care and to the creation and dissemination of medical knowledge. Forty-five years after the war ended Wilder began to draft his recollections of an era that had transformed him personally and radically altered American medicine." Edited by Richard Reid, Wilder's unfinished memoirs have now been published under the title Recollections of a Civil War Medical Cadet. Reid's introduction discusses the often disreputable state of medicine at the time of the outbreak of Civil War and explains how the conflict raised the stature of the profession. It also includes "an extensive historiographical analysis of Civil War medicine and situates Wilder’s recollections in the changing direction of the field." 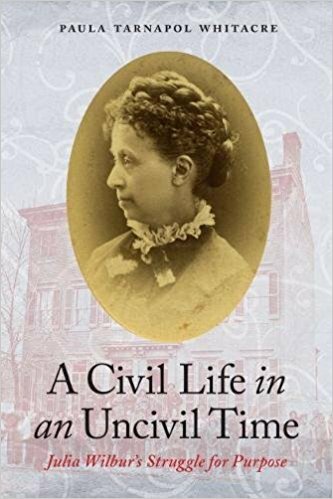 Wilder's manuscript "is written with humor and grace and provides a revealing eyewitness account of Civil War relief services and hospital work. The army hospitals, dramatically different from the prewar institutions, became centers of medical innovation and analytical record keeping. Even medical cadets such as Wilder conducted postmortems and were encouraged to submit specimens of combat-related injuries to Hammond’s newly created Army Medical Museum. His discussions of the day-to-day practice in the hospital, the war’s expansion of medical knowledge, the duties of medical cadets, scientific activity, and gender relations are particularly compelling." In addition to providing the volume's general introduction, Reid extensively annotates the material while also adding some context to Wilder's loosely arranged appendix collection. Review of Crenshaw - "RICHMOND SHALL NOT BE GIVEN UP: The Seven Days' Battles, June 25 - July 1, 1862"
As many have noted in the past, the famous "Seven Days" series of engagements fought just outside the gates of Richmond (as well as the 1862 Peninsula Campaign as a whole) remains vastly understudied in comparison to other major eastern theater campaigns of similar stature. While no full-length standalone studies have been published for any of the battles fought from June 25 through July 1 (it's hard to believe, isn't it? *), an excellent and highly detailed military examination of the Seven Days does exist with Brian Burton's Extraordinary Circumstances (2001). As part of the Emerging Civil War series tasked with offering "compelling, easy-to-read overviews of some of the Civil War's most important battles and issues," Doug Crenshaw's Richmond Shall Not Be Given Up: The Seven Days' Battles, June 25-July 1, 1862 provides budding readers, or those lacking a taste for the far deeper operational and tactical intricacies exhibited in Burton's book, with a fine general introduction to the topic. In common with all ECW series titles, the book is filled with period drawings, maps, and photographs (archival and modern), and there are space limitations for the main narrative so historical events are considerably condensed. After a brief introduction, Crenshaw quickly moves through each day of the bloody week. In terms of coverage, the author picks his battles (so to speak). Mention of some of the smaller-sized, albeit often intense, engagements (like Oak Grove and the fighting at the Golding and Garnett farms) is sparse. 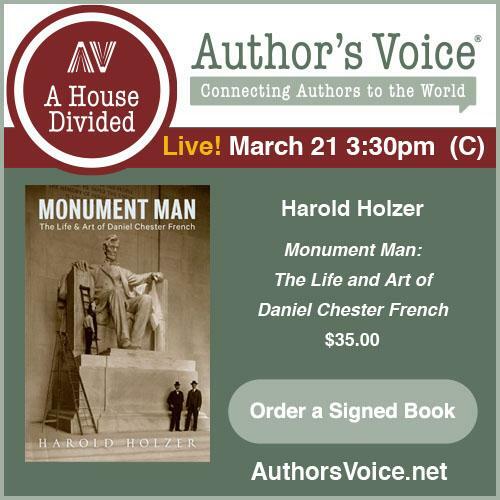 The author joins participants like Confederates Robert E. Lee and E.P. Alexander, and later observers like Lee biographer D.S. Freeman, in considering Glendale the key missed opportunity of the Seven Days operation. During that battle, a planned 70,000 man combined assault fizzled into a narrow-front frontal attack by the divisions of A.P. Hill and James Longstreet, which was duly repulsed but only after a bitter struggle. Given this interpretation, the text lends a bit more heft to the Glendale/White Oak Swamp and Malvern Hill sections, leaving somewhat lighter coverage for Beaver Dam Creek/Mechanicsville, Gaines's Mill (the campaign's largest battle in terms of numbers directly engaged and casualties suffered), and Savage's Station. The limitations of the format also mean that evaluations of the battles and leaders are broad stroke in nature. Lee devised an ingenious offensive plan that might have achieved grand results, but the effort was plagued by an inexcusable lack of good maps, poor staff work, and many bad performances by key subordinates. Criticism is leavened by the fact that the Army of Northern Virginia was still a brand new creation and was perhaps incapable of the level of coordination required. On the Union side, the analysis of McClellan's generalship is similarly traditional. The attitude of the Army of the Potomac's leader is presented as unjustifiably pessimistic, and the author joins the great majority of historical opinion in condemning McClellan's personal absence during much of the fighting as well as his compounding the effects of this self-imposed leadership vacuum by failing to appoint one of his sub-commanders to direct affairs in his stead. Crenshaw does not suggest a reason behind the latter, though it seems likely that McClellan did not trust any of his highest-ranking corps commanders, all of whom were originally appointed contrary to his wishes. The author credits McClellan's subordinates for coordinating among themselves at the tactical level a more than adequate defense, their unselfish efforts effectively thwarting Lee's several attempts at dividing and crushing them. The book has an eight-stop battlefield tour, which is integrated into the narrative (with orientation, background, discussion, and directions/GPS coordinates situated between chapters). The appendix section (frequently one of the most interesting features of the ECW series titles)) has three parts. These include discussions of Jeb Stuart's famous 'Ride Around McClellan,' a sense of the civilian experience of the fighting in Hanover and Henrico counties, and some battlefield preservation history. Though its focus is primarily military, the volume does also extend a nod toward the most recent scholarship contextualizing the Peninsula/Seven Days as a watershed moment in the war's transformation from limited war aims and more conciliatory policies to emancipation and hard war. 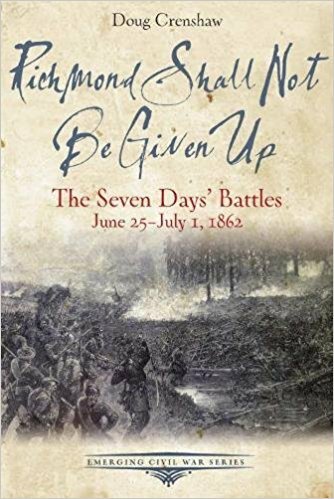 In offering a reasonably thorough overview history and tour of the Seven Days battles, Richmond Shall Not Be Given Up is a solid introduction to an important topic. * - While not the kind of exhaustive treatment referenced above, in fairness it should be mentioned that Crenshaw himself has authored a slim Glendale study that was published earlier this year. 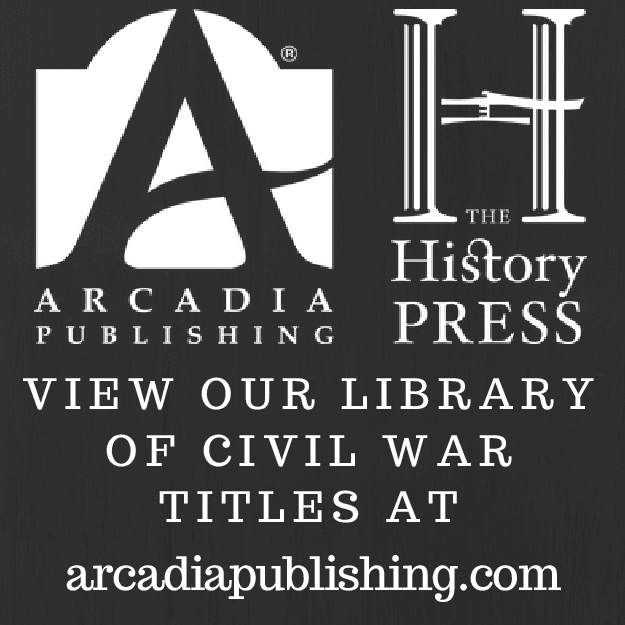 • California and the Civil War by Richard Hurley (Arcadia Pub & The Hist Press, 2017). For this particular title, the publisher solicited a blurb from me. Fortunately for all involved, I rather liked the chapter galleys that were sent to me for consideration (all told around 2/3 to 3/4 of the main text). 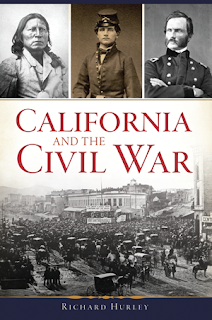 From what I read, the volume is a fine introduction to a range of social, military, and political topics related to California's Civil War, both within the state's borders and far beyond. The book description offers a sampling of what you'll find within. "As war broke out back east, a golden-tongued preacher named Reverend Thomas Starr King crisscrossed the state endeavoring to save the Golden State for the Union. Seventeen thousand California volunteers thwarted secessionist schemes and waged brutal campaigns against native tribesmen resisting white encroachment as far away as Idaho and New Mexico. And a determined battalion of California cavalry journeyed to Virginia's Shenandoah Valley to battle John Singleton Mosby, the South's deadliest partisan ranger. Author Richard Hurley delves into homefront activities during the nation's bloodiest war and chronicles the adventures of the brave men who fought far from home." According to the author bio, Hurley is a college instructor and also "a partner in Bear River Books, a publishing partnership that has produced a historical fiction novel, curated a museum exhibit, created multimedia presentations and produced a documentary all on California during the Civil War."